Roy and I on Day 3 of the Convention events. 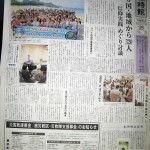 From May 28th to 30th, the Tenrikyo Hawaii Convention 2011 was held at the Hilton Hawaiian Villages Spa & Resort! The days’ events and activities include speeches by local English-speaking church ministers and group discussion activities in which participants engaged with each other on personal levels to attain further insight and enhanced experiences. There was also the Luau which was the second evening’s evening with dinner and fantastic entertaining performances by Big Jay & Riley, Halau Hula O’Ku’upuailima (a hula dance group), Yoki Daiko, and Layla Harrington, a Australian professional singer. 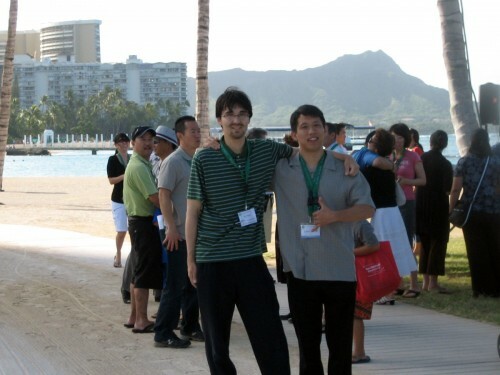 I was actually part of staff for the Convention and helped in organizing and planning. As a staff member, I was not able to attend and partake in all the event’s activities, but I was able to sense the atmosphere and talk to participants on their reactions to the Convention. I also began to hear stories of spouses beginning to attend church services and uplifting people’s outlook in applying faith into their lives. Thank you for those who attended. I will likely be in charge of uploading content on the Convention, so please be patient for what will be in store for post-convention activities and materials for those who have not been able to attend the Convention.